Background: Megachannel™ is a new colonic access system that was originally developed for colonoscopic appendectomy. Once in place, the reinforced wall protects the colon from perforation risks during rapid, multiple passes of the colonoscope to the right colon. The 20mm working channel allows the rapid and safe delivery of bulky instruments such as EUS, banders, suction cups and staplers. Additionally this large working channel also allows the removal of large specimens piece by piece. After completion of animal and cadaver tests, the aim of this study was to evaluate safety and clinical feasibility in patients undergoing colonoscopy. Results: The Megachannel™ was applied in 40 patients (19 female, mean age 48a) undergoing colonoscopy. The cecum was reached in 34/40 patients within 16min (3 to 35min), with 73cm (60 to 90cm) of the overtube being inserted into the colon. Mild tissue bruises were observed in 9 patients, mild to moderate pain was reported in 5. In 27 patients the Megachannel assisted the removal of multiple polyps as tissue was repeatedly retrieved through the device. In one patient a EUS scope was delivered for evaluation of tumor wall infiltration before submucosal resection, in another patient a suction cap was successfully delivered to the right flexure for removal of an incomplete-lifting polyp. 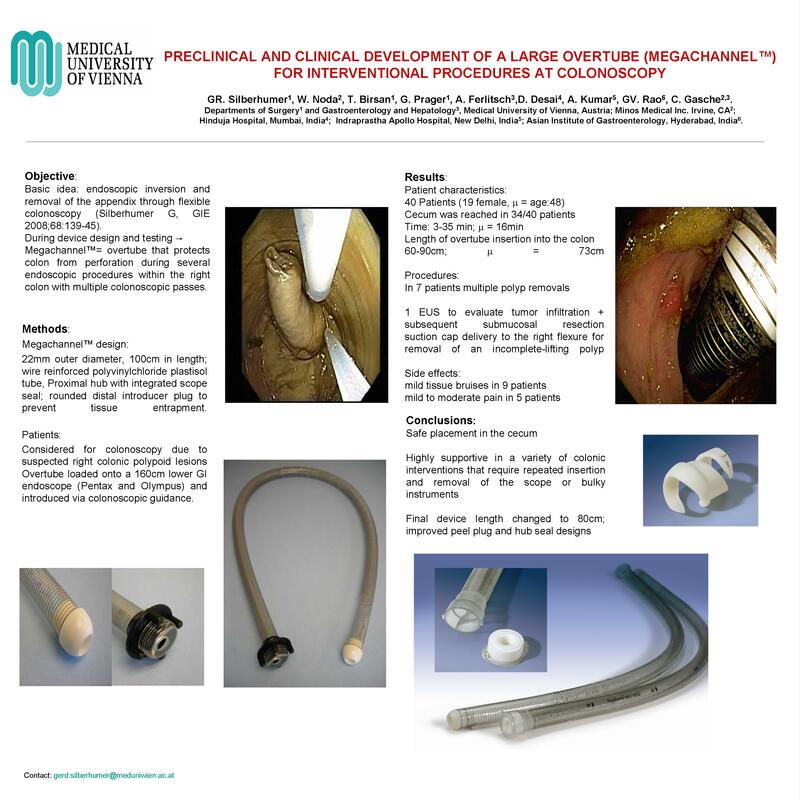 Conclusions: This new colonic access system (Megachannel™) can be safely applied into the right colon and is useful for a variety of colonic interventions that require multiple insertion of the scope (such as removal and retrieval of multiple polyps) or delivery of bulky instruments such as EUS, suction caps or banding devices. This instrument might support NOTES procedures and removal of colonic stents. The final instrument length was changed to 80cm.